Using a scoop is the fastest & easiest way to get uniform, round cookie dough portions. Great for meatballs, too. These are non-stick for easy-release cookies and can be used in place of parchment paper. This set of 3 mats fits perfectly in half and quarter sheet pans, and they cost less than one similar Silpat mat. This grid pattern cooling rack is awesome and the #1 recommendation of Cooks Illustrated. It also fits perfectly inside a half baking sheet to create a baking rack. Inspired by the popular cake, this recipe has the same taste in a melt-in-your-mouth soft cookie made completely from scratch. Inspired by the popular St. Louis Gooey Butter Cake, this recipe has the same taste in a melt-in-your-mouth soft cookie. 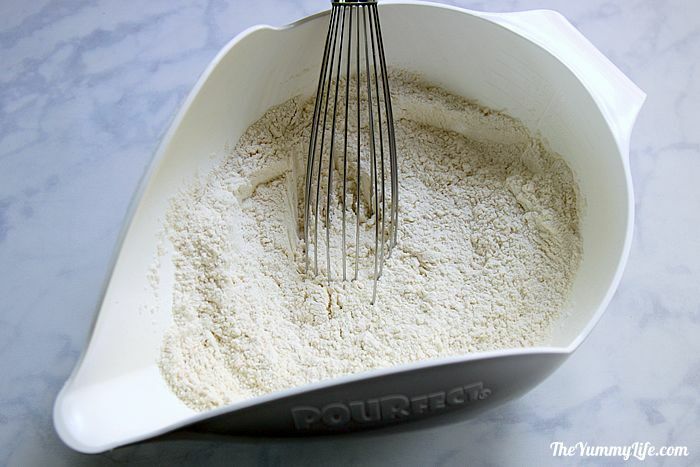 In medium bowl, whisk together the flour, baking powder, baking soda, and salt. Set aside. 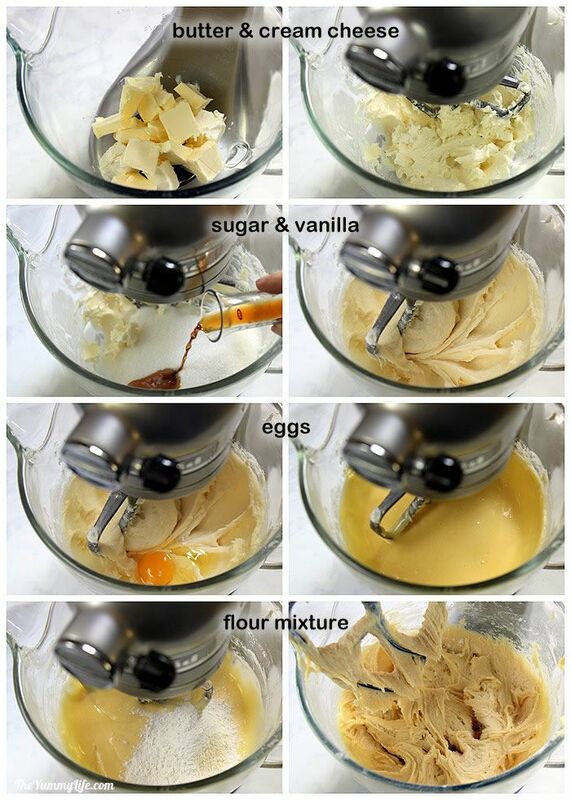 In large bowl, use electric mixer to beat together the butter and cream cheese until light and fluffy. Add sugar and vanilla; beat until well combined. Add eggs one at a time, beating each one into mixture until completely combined before adding the next one. Gradually add in flour mixture, and third at a time, and beat until uniformly mixed. Cover and refrigerate for at least 2 hours; dough may be refrigerated for up to 24 hours. 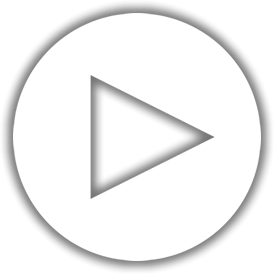 SHAPE DOUGH AND BAKE: Preheat oven to 350 degrees. Line large baking sheet with parchment paper or silicone mat. 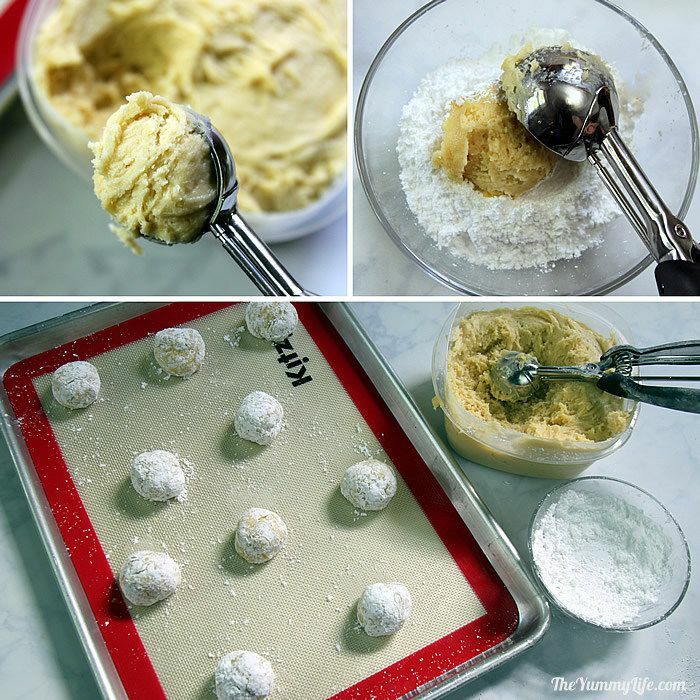 Form walnut size balls (2 tablespoons) of chilled cookie dough. (A medium cookie scoop is the easiest way to achieve uniform cookie portions.) Roll each dough ball in powdered sugar until evenly coated. (NOTE: Dough is very sticky, so it's easier if you first drop mounds of dough into the powdered sugar without handling it, and then roll it around in the sugar with your hands.) Place on baking sheet 2" apart. BAKE for 12-15 minutes, until they are set with no visible wet areas, but not browned at all. (Be careful not to overcook them so they'll be soft and slightly gooey when they've cooled.) Remove from oven and rest on pan for 5 minutes before transferring cookies to cooling rack. Cool completely. Dust with additional powdered sugar, if desired. Makes 32 cookies, 3-1/2 inch diameter after baked. STORE in airtight container at room temperature. Cookies may be baked ahead and frozen for up to one month; thaw and sprinkle with a fresh dusting of powdered sugar before serving. 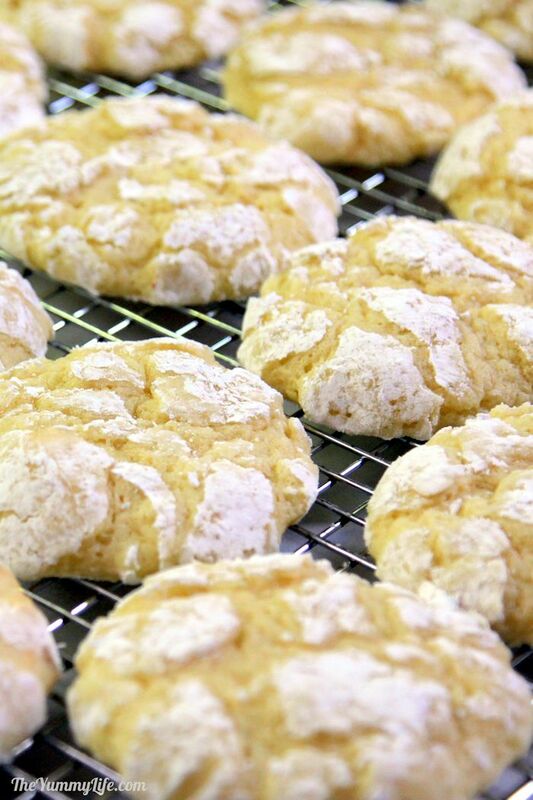 FOR 15 JUMBO COOKIES (baked 4-1/2 inch diameter): Form dough into golf ball size balls, bake 18-20 minutes. These soft, melt-in-your-mouth cookies are the offspring of the St. Louis Gooey Butter Cake recipe I shared in a previous post. Using similar ingredients, this cookie version has the same fabulous flavor of the cake that is loved throughout St. Louis and beyond. Personally, I love these cookies even more than the cake, and that's sayin' something! I ate my first gooey butter cookie years ago at The Blue Owl Restaurant and Bakery in Kimmswick, Missouri. It was a favorite place for lunch when I was out and about with my friend Sheri. (Check out Sheri's awesome yarn and fabric shop, The Loopy Ewe.) When the St. Louis Post Dispatch published The Blue Owl's recipe for gooey butter cookies, I was excited to be able to make them at home. Since then, I've created my own version of the recipe that omits the yellow cake mix and is made completely from scratch; it's simply a cookie version of my gooey butter cake recipe. Gooey Butter Cookies, like the cake, are so popular in St. Louis that they are sold at most grocery stores here, like these at my local Schnucks. Step 2. 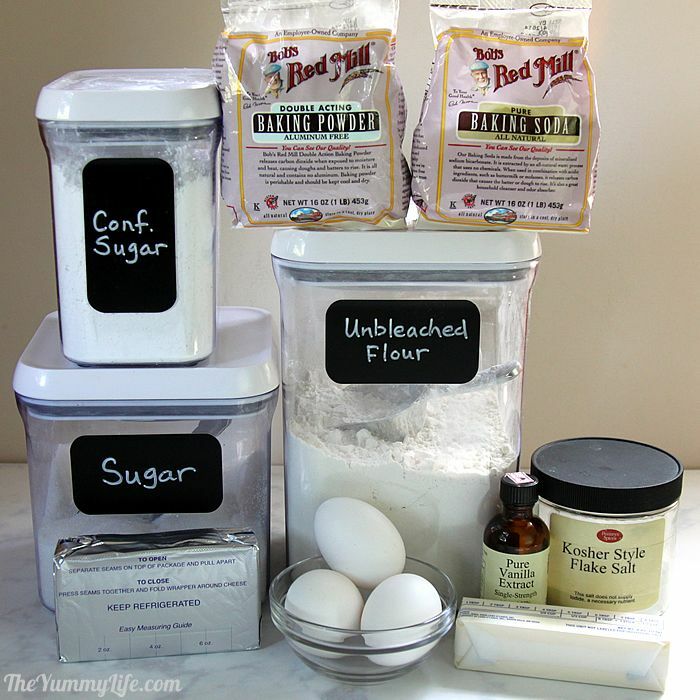 Begin by whisking the dry ingredients together. Step 5. Form walnut size balls (2 tablespoons) of chilled cookie dough. (This size will make 32 cookies; when baked they are 3-1/2 inches in diameter.) Roll each dough ball in powdered sugar until evenly coated. TIP 1: Use a medium cookie scoop to form uniform portions of cookie dough. TIP 2: The dough is very sticky, and can be difficult to handle. So, first, without touching the dough, drop mounds of it into the powdered sugar and then roll it around with your hands. The sugar coating makes it easier to handle and form balls. TIP 3: For 15 jumbo cookies (baked 4-1/2 inch diameter), form dough into golf ball size balls. Step 6. Line a large baking sheet with parchment paper or a silicone mat. Place dough balls on baking sheet 2" apart. Step 7. Bake cookies until they are set with no visible wet areas but not browned at all, 12-15 minutes. (Be careful not to overcook them to maintain a soft, slightly gooey texture.) The jumbo size takes 18-20 minutes. Step 8. Remove from the oven, rest on the pan for 5 minutes, and then transfer to a wire rack to cool completely. 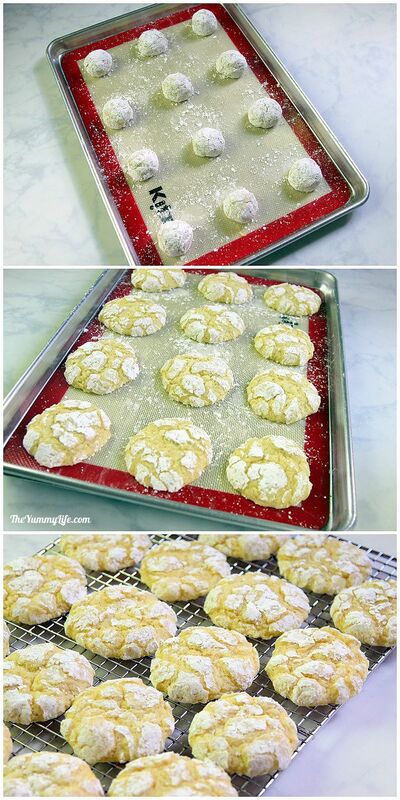 You can dust the cookies with more powdered sugar, if desired. Store the cooled cookies in an airtight container at room temperature. Freezable! The cookies may be baked ahead, wrapped well, and frozen for up to one month. Sprinkle thawed cookies with a fresh dusting of powdered sugar before serving. 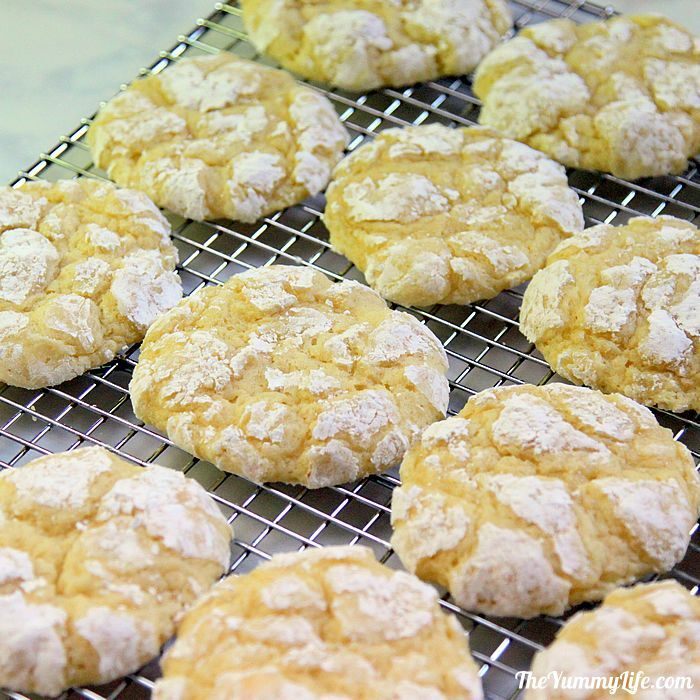 These cookies are so good--soft, gooey, and wonderful! I also like to use them for ice cream sandwiches and will be sharing that recipe in a future post.